Hello from Highland Park, North of Chicago, USA! I purchased my MY00 Silverstone/Black S2000 in Jan or early Feb of 2017, with 15,800 miles on the odometer. It was entirely stock, and had sat under a car cover for some time. The seller, a smaller dealership, had picked it up, presumably from an estate sale, and I happened to be in the market at the right time. 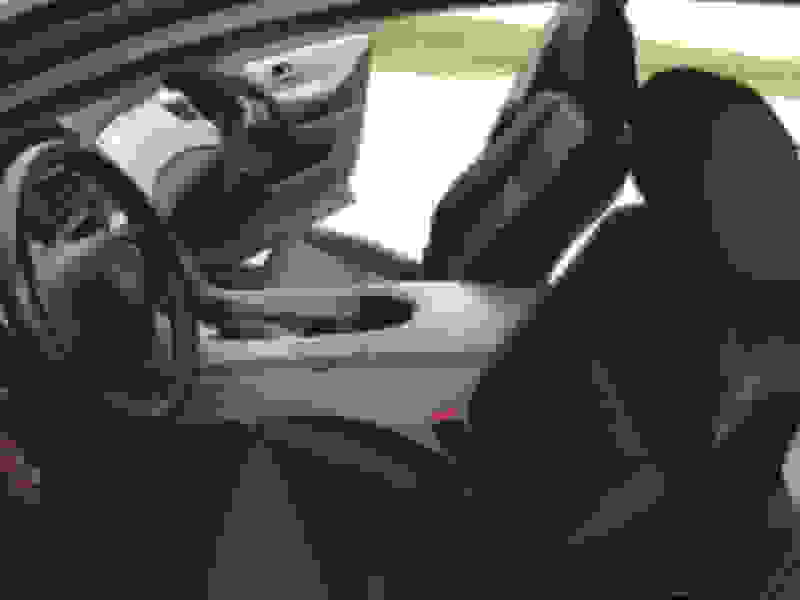 I came from a too-remote 2015 Audi S5, looking to replicate or build upon the direct feeling of my 2000 Honda Prelude, which had a fully built suspension. I had never been in an S2000 prior to the test drive. The loudness and raw sounds surprised me, but I appreciated how direct the car was, so I took it home. 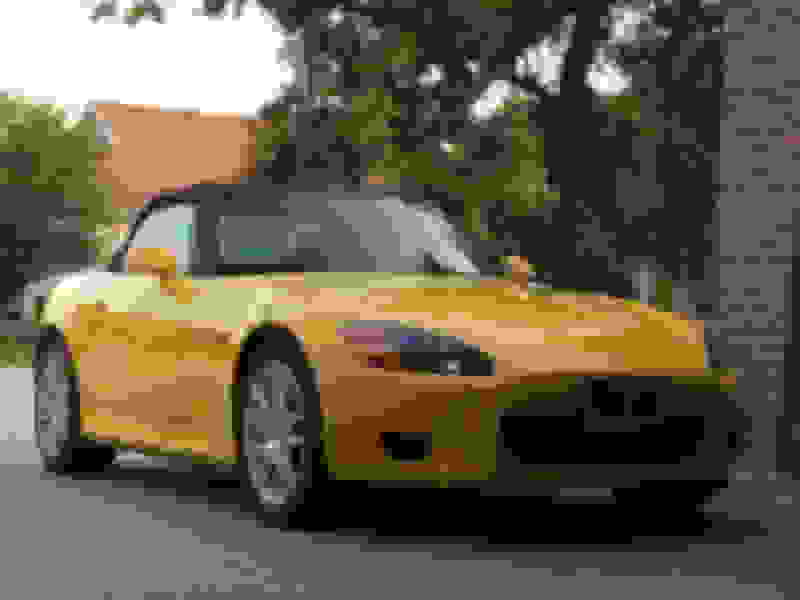 I had studied S2000s via forums and videos, and I was wary of oversteer. I've had experience with RWD vehicles, but the S2000's short wheelbase and suspension geometry set it apart. Of course, it started raining hard as soon as I left the dealership, so I spent my first 45 minutes clutching the wheel and keeping my inputs as smooth as possible. Since then, I've put 10,000 glorious miles on the car, expanding my comfort zone every step of the way. I haven't spun yet, but have come close 3-4 times. I've learnt that my reaction time is pretty good. I can maintain a slip angle through curves, though it's significantly more challenging in the wet. I've driven the car through two winters, and needed snow tires for the current season. The car is as raw / thrilling / unforgiving as I'd hoped, and I'm a better driver as a result. My thanks to you all for your knowledgeable contributions, which led to my ownership of this car. No mods yet. The only planned mod is an exhaust, and that's just a twinkle in my eye at this point. Enkei RPF1 SBC staggered wheels (no fender rolling) are in my garage, but I'm saving money toward tires. I also have a Toyota FJ Cruiser that I'm slowly building up, plus all of the normal expenses of life, so it's a balancing act. Good choice on the FJ cruiser, Ive come from a tacoma and now in my second tundra! Welcome! Find the secret compartment?? 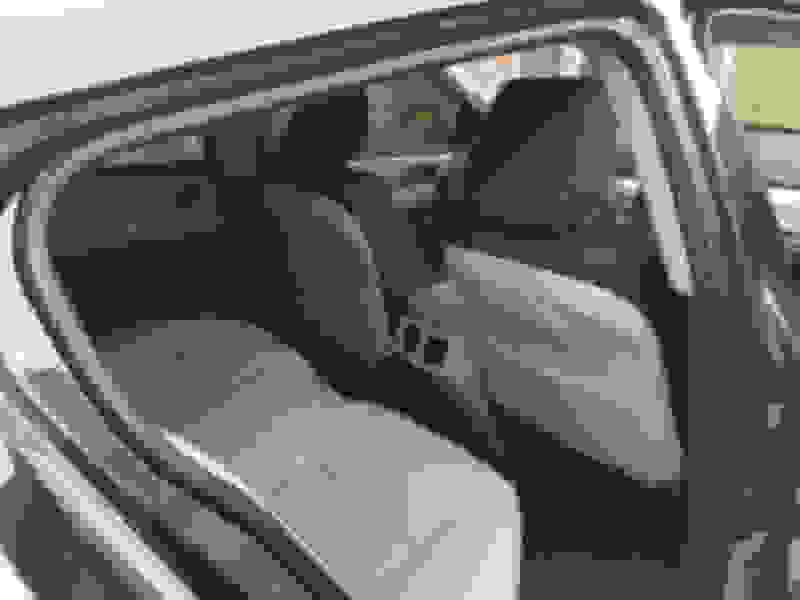 Haha, I knew about the secret compartment from researching the car in-depth. What eluded me was the fuel door release. A friend who had owned an S2K challenged me to find it on my own, but after about five minutes at a gas station, I had to consult the manual. That one got me as well. What a great story and welcome to the forum! 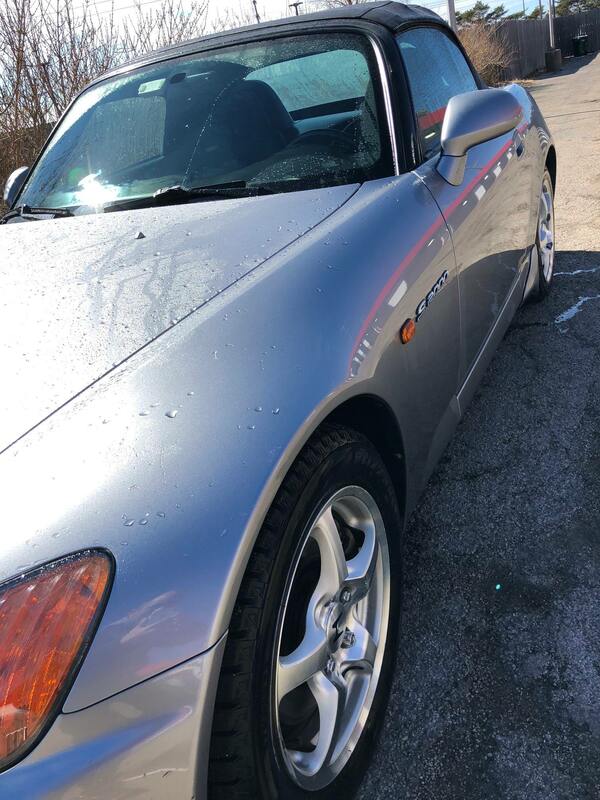 Let’s see some pics of that rare 15K S2000! Indeed. 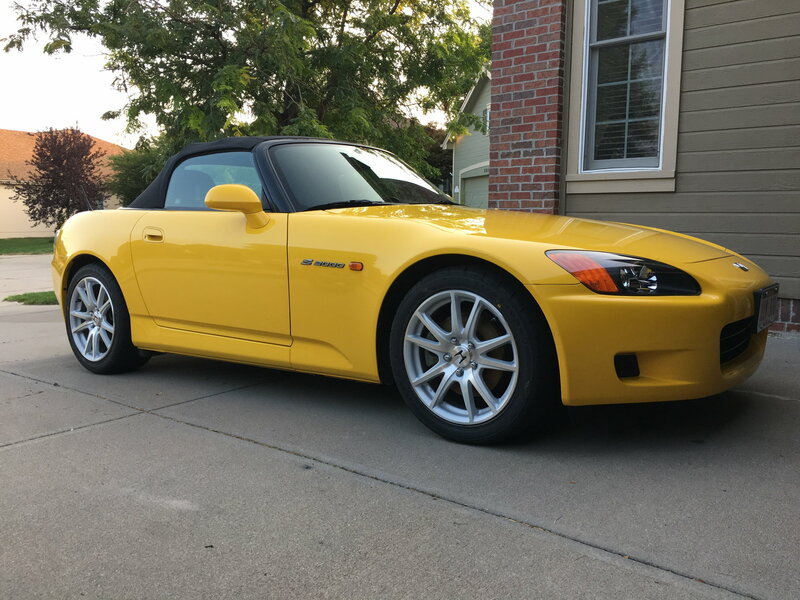 I too had not driven an S2000 until I purchased one long distance; also stock and low miles. I might add you may wish to wait at least a year or so before making mods as significant as the ones you mention. The geometry is really very good out of the box. Many times people make it worse than what Honda came up with. As for the exhaust, I find that is sounds just fine when I wind it up but the drone is minimal when cruising so you can listen to music or your passenger without being annoyed. Here are a few photos I took after a spray wash this weekend. Sorry for the water everywhere, but you get the idea. The exterior was perfect when I got it, but after 10,000 on Chicago highways, there are several tiny rock chips. I don't sweat those because I plan to repaint it (same color) when the need eventually arises. 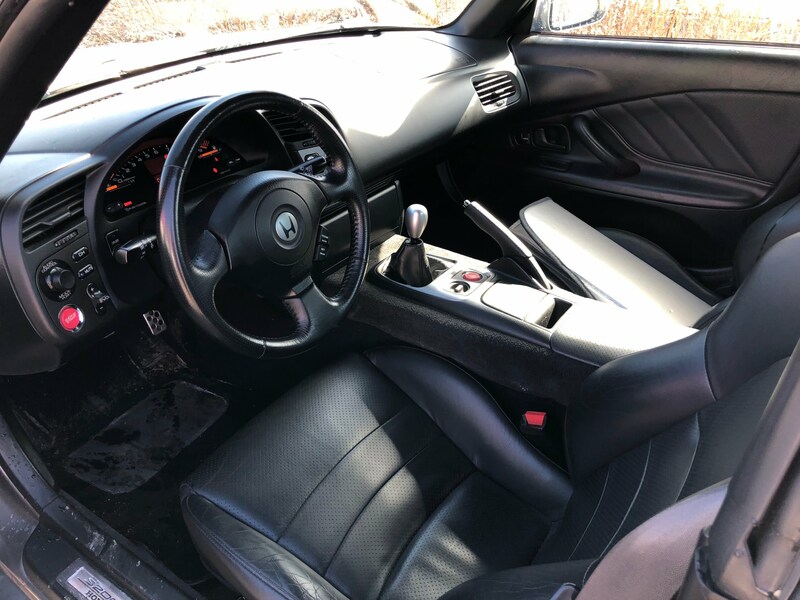 The interior was/is perfect except for the driver's seat bolster (shown), and exactly two pin-head-sized spots in the paint around the shifter, where the previous owner might have dropped some keys. I was really happy to get the OEM spoiler, front lip, and side strakes. I tossed out the decrepit OEM floor mats, and got RicksS2K carpet mats, which performed perfectly. Last edited by DallasDz; 03-12-2018 at 08:24 AM. What led you to seek out an S2000 long-distance, without having driven one? Had you ridden in one before? I love the suspension compromise between handling and stiffness, and I don't want to change it. I want the lowered-but-functional look, but not so much that I'll move away from the stock shocks before they're dead. The new RPF1s are just for looks and grip. Until this Winter, I was running the OEM Bridgestones, which have plenty of tread left, but not much grip. There's no way they're the original tires, right? I keep forgetting to look at the manufacturing date on them. I've definitely read what you're saying about the exhaust. I plan to ride in a few S2000s with various exhausts before purchasing one, to make sure that they make the sound I'm after. As a driver, I'd like to hear the exhaust balanced with the engine sound, and my passengers all understand that we'll have to speak up during the drive. With that said, I do love the OEM exhaust sound too. It's a nice sound, just not loud enough. I enjoy loud cars. Even my son's EK coupe is too quiet for my liking. I had never driven an S2000; I did not know anyone who owned one. I did speak to an occasional owner at gas stations or the like. I also did a lot of research. The first time I drove one was the one I already owned for two weeks! Dealer drove it to the airport in Phoenix to pick me up in it. Why the distance? (I live east of Sacramento and my 2009 was in Phoenix) I wanted a west coast car to avoid any corrosion issues. I had been tracking this one car for months on eBay. It never reached reserve. I finally contacted the dealer who had it and began discussions. The reserve was way over book. We came to an agreement and I purchased it sight unseen, not counting the bazzilion pictures they had. It was a low miles (30K) 2009 Rio Yellow (my favorite) stock, one owner car that had never been abused in any way. I knew I would never see another one like this in a while. Only 38 09 Rio Yellows were sold in the US. So I purchased it the car and told them it would be a few weeks to get it. I thought about shipping it but the drive was too tempting. It was springtime, through the desert and over the Sonora Pass home. Two days of great top down driving. I now have 65K miles on it. I did add some BQuiet and 3M Thinsulate under the carpet and in the doors to improve radio sound and make the cabin quieter on the freeways with my wife. I stopped forward of the transverse hump to keep the engine sound. I have performed 2 valve adjustments, performed the rear axle tightening of the axle bolt, and replaced the TCT with a Billman GenX. I also swapped out the OEM head unit for a 45 amp Sony with adjustable colors (to match the S). I link it to my Note phone for streaming so I hardly ever open the CR radio door now. I used Modifry plug and play connectors and the DCI dash interface he has. Works perfectly. After the new HU and sound insulation I found the stock speakers were not that bad after all so I wound up not replacing then but keeping them. 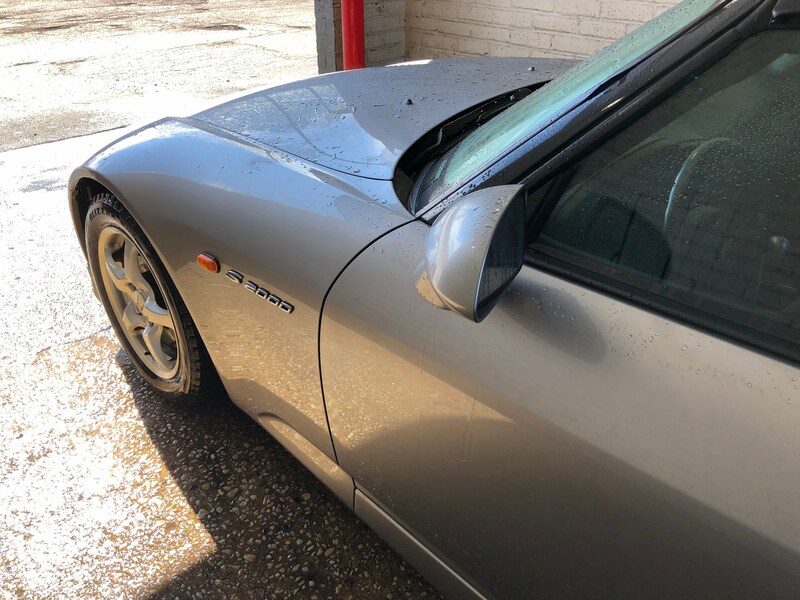 BTW, as far as your rock chips go, if you do a little research you will find it is pretty easy to make those chips disappear with very good results. You won't have to do a complete paint over. It appears to me your paint job is really nice. Keep it. Last edited by cosmomiller; 03-13-2018 at 02:53 PM. Talk about diving in! Driving an S2000 for the first time, all the way from AZ to CA, sounds like a dream come true. I've always wanted to buy a car far away, and drive it home. The closest I got was IL to IA in my Prelude, which had a stuck caliper metal-to-metal the entire time. Scrrrraaape. Not exactly what I had in mind. Nice work on the car hunting. You obviously had a specific target in mind. Why valve adjustments at such low mileage? Is that recommended? 3M Thinsulate; do you find that it keeps cold/heat from leaking into the cabin, or was that part of a sound dampening solution? Valve adjustments are recommended much earlier than what Honda puts in writing but only for the drive by wire cars. The exhaust valves can become a bit tight leading to torching. You should do the axle nut tightening. Trying to find a thread on that but I am out of time right now. Below is a link to the sound/ NVH thread I did. Coincidentally (or maybe not, seeing how many ppl have had similar experiences), I never sat in an S2000 before buying mine either. In fact, the reason I went to look at the one now sitting in my garage was to simply sit in (and maybe drive) it just to see if I liked the car enough to continue searching for one that would meet my criteria (yellow wasn't one of them). 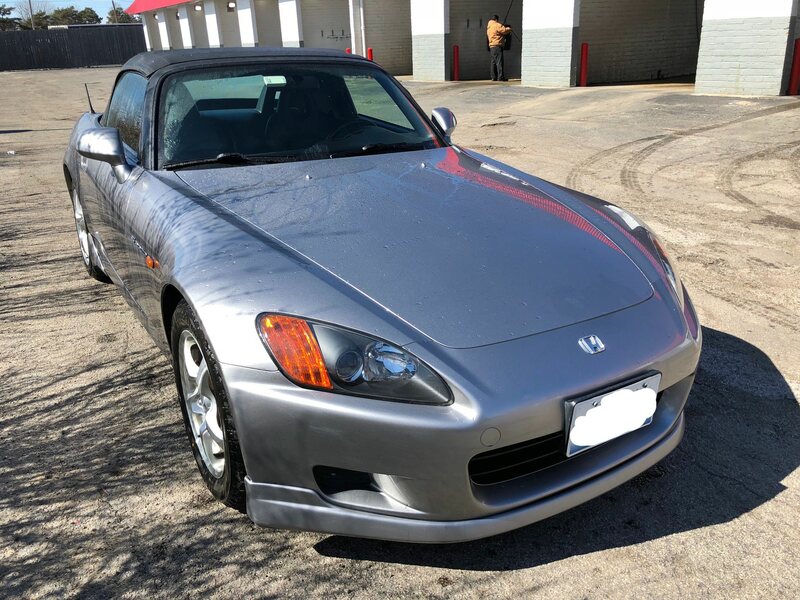 A few years prior, I had an NB Miata ('04) and enjoyed it, but had heard enough about the S2K to consider making it my next fun car (I've been on a 5+ year mission to own (then sell) a car every year or two, to make up for the frustration of never being able to buy a fun car during the first 40 years of my driving life). 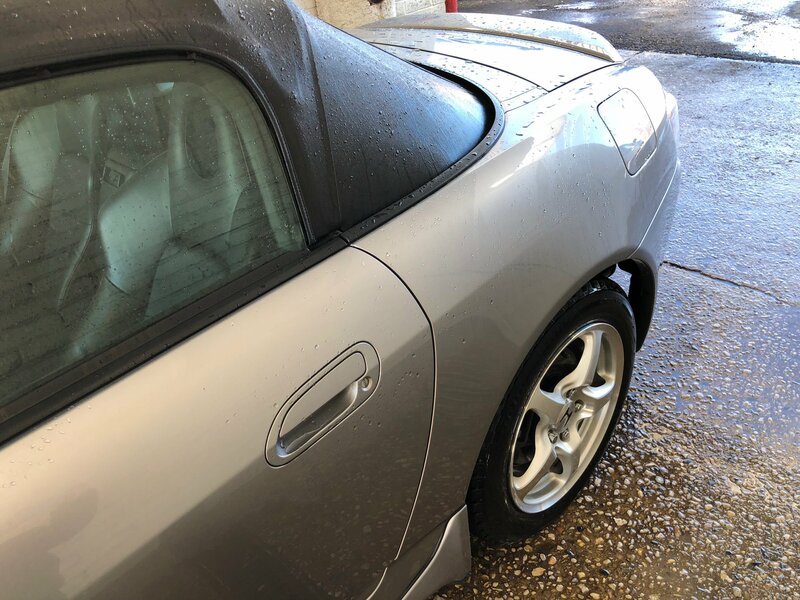 So the story is pretty simple: Saw a MY03 S2000 on eBay that looked good enough (low miles, average price for year and miles), and the feature that made it attractive to me was its proximity. It was only about 30 minutes from my home in a smallish Virginia town between Charlottesville and DC - how convenient! I contacted the seller (owners' son) and showed up at "Mom and Dad's" place to look, try the car on for size (literally, I'm 6'1", 225, so fitting was questionable), and maybe drive, if the seller was okay with it - but I wouldn't push that bc I was really just looking for reference at this point. By the time we got around to it talking about a test drive, I told my teen son, who had accompanied me thru the summer on many a car-seeking journey, if the car drove as expected, that I would probably buy it.... It was in THAT good shape and I had a good feeling about the owner. Similarly, the sellers could see it in my eyes, and the "little old lady" even said to her husband, "I knew the first people to see the car would buy it". She was right, and an hour or so later I was driving away in a one-owner, Spa Yellow AP1, adding to the 14,110 miles already on the odometer. And so begins not only my life as an S2000 owner, but as a Honda owner too. A very uneventful history about the car (which is what we all hope for in a used car purchase, right? ): A 'little old lady' (75) had gotten it because it was 'cute' and she had to have a yellow one at age 60. She pampered but rarely drove the thing. Last year her husband put 17 miles on the car because she was not driving it due to an injury. Mileage included a 14-mile trip for the annual state inspection, and 3 miles going up and down their paved rural driveway to keep the thing running. Last oil change documentation they could produce was 2014, but the synthetic oil looked clear as a bell and, given the few miles driven and its permanent spot in a very nice garage, service intervals were of no concern to me. In the end, what was intended as a scouting mission to see if S2000's were something I should look at turned into a an on-the-spot purchase. Now, after a couple weeks, a new set of tires (15 year originals seemed risky) with fresh alignment, new oil, coolant, and filters and I feel good to go for another year or two. I couldn't be happier and have had a couple nice drives along the winding roads at the feet of the Blue Ridge Mountains. Washed it (again) today, but will keep the keys hidden till I can get my own wax on the like-new finish, whose flaws are 1) a shallow, short and thin scratch near left taillight, 2) three tiny rock chips, and 3) the underside of the front air dam was the obvious victim of a typical parking curb run-over. Having the joy and privilege of owning a car I would love to have been able to buy new, but at a time I was in the throes of building a home, family, business, etc., in about the same condition it would have been in back then - well, the luck is just hard to believe. I missed so many cars I would love to have owned or even just driven over the years, and this feels like I was granted one wish from a genie to turn back the car clock and get just one I wished I could have had "back in the day" but has been out of production for most of a decade. I also love that others just like it - more than I would have expected - seem to be finding their way to happy buyers like me. Seems a lot of people were buying them as occasional or collector cars and those of us who weren't so fortunate still have second chances all these years later. What a blast! So, Ruckersville, Gordonsville, Madison area. I grew up in C'ville, went to the U and then traveled until I ended up in Alexandria. If you. hurry, you still have time to register for the Gettysburg Get Together and meet even more S2K owners. I wasn't even considering as S2000 when I bought mine. Just couldn't pass up the deal I got. Pics or it didn't happen and you're just writing with heartfelt enthusiasm and gratitude for no reason. What a great story, with an especially resounding closing paragraph. I'm very happy for you, and happy that this is happening for other people. Everyone tries to play it cool, like it's just a machine, but driving the S2K continues to be one of the best parts of my life to-date. I've now added about 14k miles, 10k/year, and have added larger wheels and tires (no fender work or other mods). The car is a dream come true every single day. I get in, start it, and it hits me all over again. 'Wow, this thing is amazing. I'm so fortunate to have it.' I get excited like I was five years old, every time I drive. How many people have that in their lives? Do you plan to modify anything, or will you keep it stock? If you care to share, what kind of deal did you get? Got traded in at the dealership I work at. Talked to the used car manager and got it for $500 over what they gave them for a trade in. Bought my 2000 in 09 with 81K on it for $10K plus tax and tags. How awesome to have something - ANYthing - that gives you the kind of feeling you described! I think the realization is still sinking in for me (been busy and weather's been ugly, so haven't had as much time with it as I would have liked - yet). I did still manage to get some sealant buffed into the finish of all panels forward of the windshield this evening. Assuming I do the rest tomorrow, I'll get some "best it'll ever be" pics to show my new brethren here. Mods? Not now... The more I think of it, probably not ever. It would surely anger the car Gods to change anything about this one -- just feels like it would be wrong to monkey with such a clean example still in stock form. Always been a purist with most things anyhow, and after stewing on it a few days, I definitely want to experience and appreciate the car as it was designed and built by Honda. Like you, I want to enjoy it A LOT, and with Fall fast approaching, I expect to add miles at an alarming rate for +/- the next couple of months. As someone (you?) pointed out earlier, "It will still be a low mileage car", even if I add 7-8k per year as expected. At that rate for the next 10 years, it would still be a sub 100k car on its 25th birthday. I'm more than fine with that. Its only due to the fact I stumbled onto one in much better condition than expected that I have pondered holding back and treating it with pet gloves... but I'm just not that kind of guy. And I bought the car to feel the exhilaration and joy you described, not have a garage queen to dote on. I'll still treat it extremely well, but I'm the type who would buy a half million dollar supercar ONLY IF I could afford to take the depreciation hit that'd come from DRIVING it. And so it will be with this shiny, new-to-me toy. So then, is there a link to the Gettysburg event. I must go! I'm in C'ville and also attended AHS, but spent senior year at the new Western Albemarle out in Crozet - I was in the first class to graduate there ('7 . A lot of farm boys in pickups or hopped-up Baracudas then. Now the lots are full of newer cars, from Toyotas to BMW's... Urban sprawl, youy know. You lucky people who work at dealerships! Every one that I read about has gotten a killer deal. I should try to get an IT job at a dealership or something. Nah, I'd end up helping the techs and neglecting my work. I never get tired of seeing S2000s. Wow, that's clean! Your driver-side seat bolster is in better condition than mine was at 15,800. You'll appreciate that glass rear window; I sure wish that I had one. Yellow is definitely not my favorite color for cars, but it looks particularly good on the S2K, as does red. As an aside, my FJ Cruiser is yellow, another exception to the rule. Agree 100% with you on yellow, Dallas. The FJ as well. 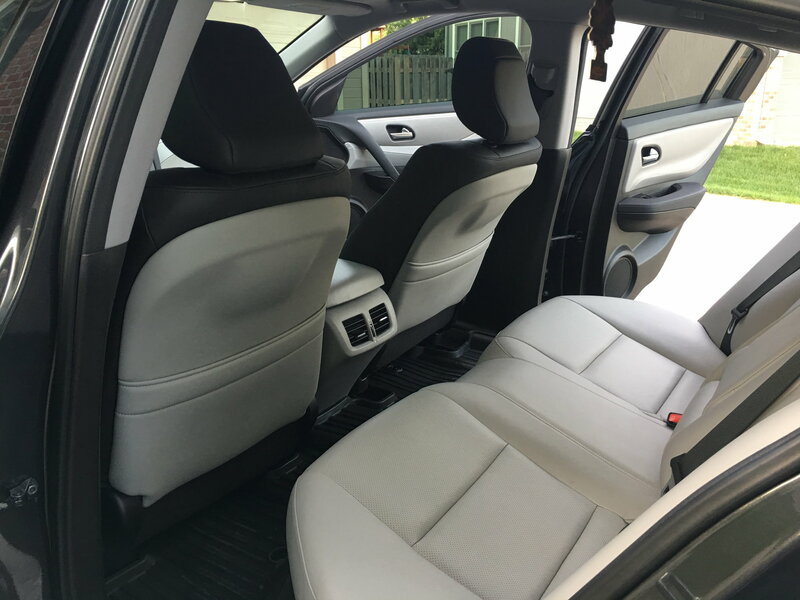 Bolsters look new, but the driver's seat left hip cushion is very softened (where someone would turn and rest a leg for a moment getting in or out) under the leather which remains almost perfect in appearance (we'll just keep that a secret). Definitely like having glass in the back vs plastic. Its odd tho, as the whole window is mounted in a way - presumably to work with the retracting roof - that results in the glass piece kind of buffeting in and out at highway speeds. Makes a little noise (no big deal, the car is not a slick highway cruiser), but at first I was worried something was wrong. Best I can tell, its fine; Just one of the "weird quirks and features". Speaking again about mods, anyone here think bigger wheels (going to the Ap2 size) makes a worthwhile difference on an AP1? I think it might look proportionately better, but if it added some handling improvement, I would someday consider that. Okay, well it now sits in the garage all waxed and I have two hours to kill. A bunch of pics before the brake and road dust take the sparkle off, then out to the country roads - woohooooo!!! Nice Carbide, very nice. Looks familiar.....HA! Regarding the rear window, I wonder if your top might benefit from tightening. I don't yet know how it's done, but you might try a quick search to see if what you're experiencing is a typical symptom. I went from stock AP1 wheels with square tires (same size front and rear) to 17x8 front and 17x9 rear and very sticky Dunlop Direzza IIIs. The additional traction removed some of the wild rotating fun, but made the car much more stable, especially at higher speeds. The handling is the same, but the car is less prone to rotating, which translates to safety in unpredictable road situations. The larger wheels look better on the car, but hurt acceleration just a little. In retrospect, I would've been happy with 16" wheels and more capable tires. I put stock 17X7 and 17X8.5 on the FR and RR with Firehawk Indy 500's and really enjoy how the car feels and handles. My plastic rear window shows the wear of 17 years of up and down, but I will leave as is for a few years before I address. I had Firehawk Indy 500s on my Prelude, and they were awesome. Great feedback and tons of grip. Good choice IMO! S2000 + FJ = Wide gamut of automotive thrills on a reasonable budget. These are permanent cars for us, and my wife daily-drives the FJ (which she chose). Man, I loved my Prelude (2000). I built it up myself, did all of the labor myself. From junkyard candidate to fully restored and track-ready, except for windshield seals and paint. I replaced every part that was even slightly imperfect. It would've been show-quality. I practically gave it to a guy in a small town who really LOVED Preludes but didn't have the means to get anything but a junker. It gave him what I couldn't have when I was his age. He reminded me of myself at that age, and he really loved the car, not to mention that he was a great driver who could appreciate the fully built suspension. Part of me still wishes that I had the Prelude, but then, I might never have gotten the S. Not to get off-track or anything. I read your intro thread, typed a reply, and then the browser crashed. Your car looks awesome, and I like your choice of wheels/tires. Reminds me that I really need to deep-clean my car. My first job out of the U was at Teledyne on the turn at Earlysville. I used to fly out of CHO. Learned to fly at Milton (if you remember that, you are a native ). I graduated from AHS in '62. I had to go back and take a Civics class that I managed to avoid until they caught up with me. Rio Rd. was a lot more interesting in those days and the reservoir to Earlysville used to be my "warm-up" drive before track weekends. I've always wanted to buy a car far away, and drive it home. The 2010 TL 6MT: Drove it back to Omaha from Plano. Traded it for a 2015 SHAWD TLX. Not my best move car-wise. Should have kept the 6MT. The 2013 ZDX: Drove it back from Cincinnati to Omaha. 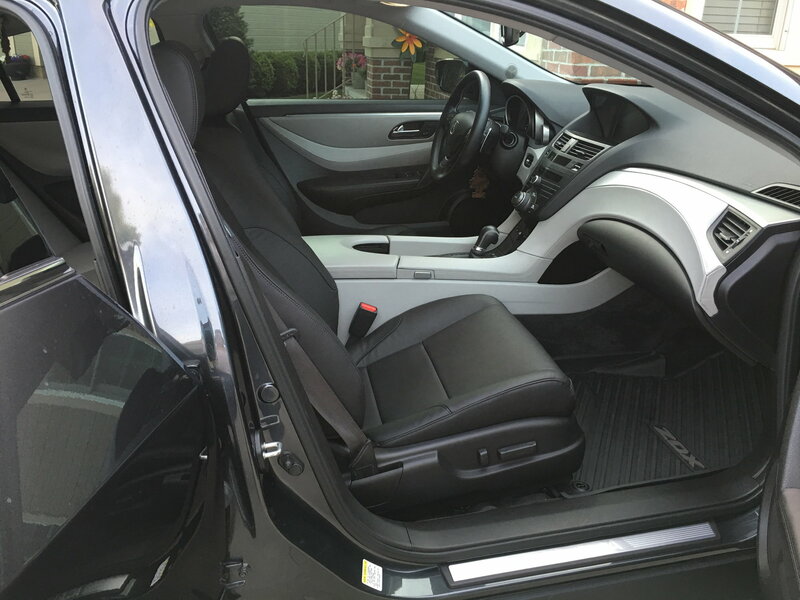 Had the front seats recovered in Ebony as there was a blotch on the driver seat cushion. I love the two-tone look. Beautiful - great pics 'Life, and quite familiar indeed! Think I might go to bigger wheels/tires one day. No problem with spinout fears in spirited driving EXCEPT when passing an oncoming road hog on a backroad and having to ride the edge till passed. Regaining full stability gets squirrelly. Also, pix of TLX = great looking interior. The Boar's Head Inn must've just been getting going in your days here as well. My parents bought a building lot just up the drive from there mid-60's when we were living in Greensboro. Eventually moved there as one of the first (and probably most modest) homes. Now just rich, older folks - a few families coming in, but has become a pretty posh location over the years, and the Inn has gotten large and well-known - - now property of The U, as John Rogan, founder/owner till death, left it all, lock, stock, and barrel, to them! We should start a nostalgia thread. . Not only did I know George Bailey, I knew all the Albemarle Co. LEO's. My grandfather was one of them. I used to shoot for the Daily Progress when Jim Carpenter was the head photog and did a lot of crime scenes for both the County and the City. I knew John Rogan very well. My parents belonged to Farmington so we knew what was coming when he bought the land across Rt 250 and started digging holes in the ground. I even worked the Inn front desk and night auditor shifts for a couple of Summers. I raced at VIR and Summit Point. There wasn't much else around in those days. Upper Marlboro had a track for a couple of years and I raced there once or twice. That's where I bent my first pure race car in an amateur event. A 56 Alfa Romeo Guilietta. Gorgeous car but handled like a tank. Gotta say I am enjoying the hell out of the back and forth stories between C'bide and KG. Good stuff guys, thanks for sharing. I love history.